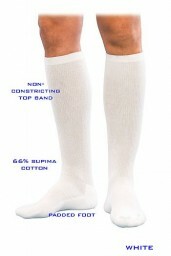 What's special about Sigvaris 182C Well Being Cushioned Cotton 15-20mmHg Closed Toe Men's Knee Highs? New Box. Same Great Product! Sigvaris Well Being (formerly Samson) Cushioned Cotton Ribbed 15-20 mmHg Closed Toe Men's Knee Highs available in black and white. Sold per pair. Sigvaris Well Being (Samson) Cushioned Cotton Ribbed 15-20 mmHg Closed Toe Men's Knee Highs available in black and white. Sold per pair. Sigvaris Well Being, Cushioned Cotton Socks. 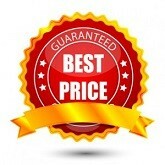 Graduated Compression Socks for Improved Circulation. Sigvaris - Life for Legs. Graduated support socks - Knee-Hi. Calcetines de soporte graduados - Jarret. Chaussettes de support gradué - Hasta la rodlla. The only product in its class to combine 15-20 mmHg of therapeutic compression with Supima™ Cotton, the world's finest cotton. Soft, comfortable, cushioned sole, toes, and heel that protects the feet and helps to absorb impact upon walking and running. Low profile toe seams that reduce friction and irritation, especially during walking and running. 68% Supima™ Cotton that makes this product ideal for those with sensitive skin and for wearing in all types of temperatures. Non constricting top band, Padded Foot. Sigvaris 182C Well Being Cushioned Cotton 15-20mmHg Closed Toe Men's Knee Highs.